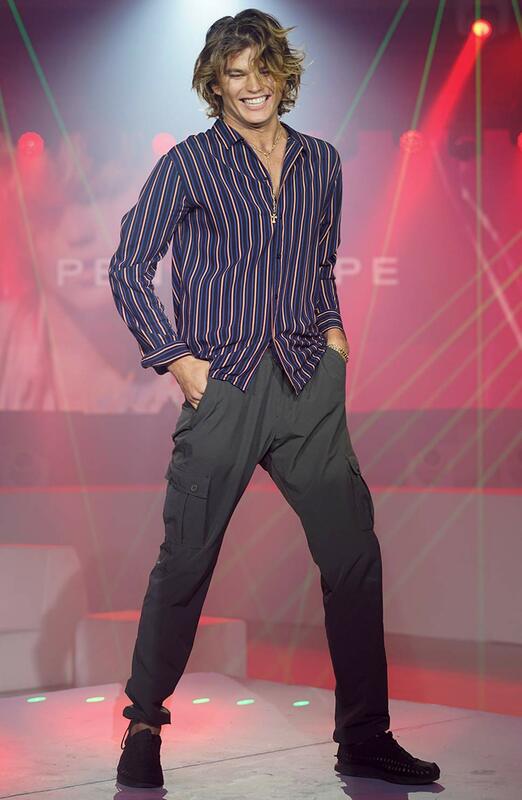 The Australian model visits Manila to launch the holiday collection of Penshoppe. 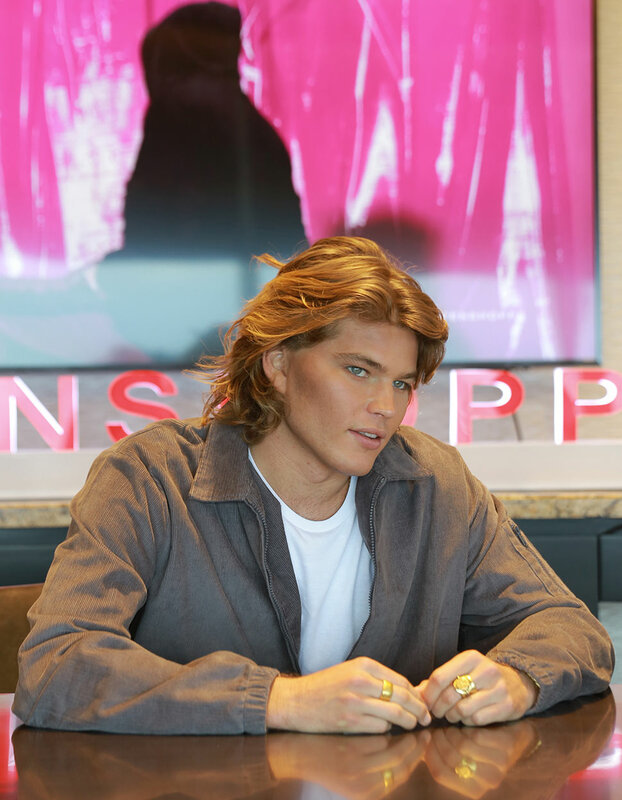 Jordan Barrett has been characterized as the bad boy of fashion, but really the Australian model, who is also one of the ambassadors of clothing powerhouse Penshoppe, is just a very curious, happy, and energetic 22-year-old out to lead his best life. 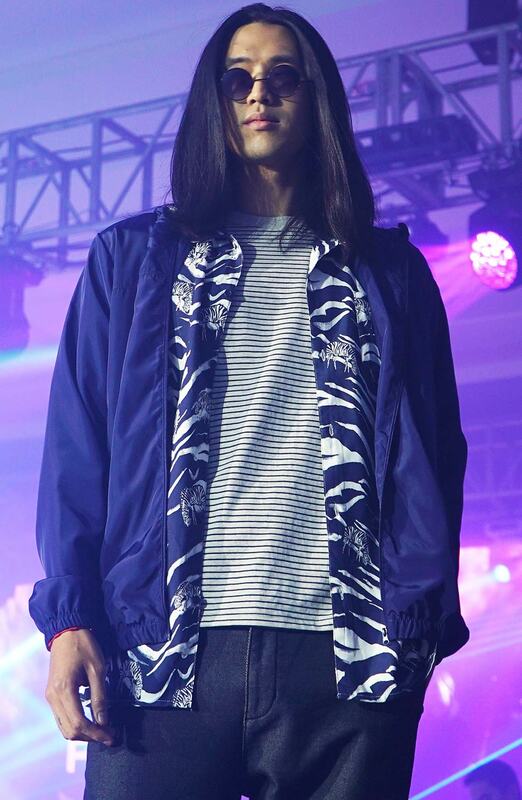 On his recent trip to Manila, the model was intent on experiencing all that he can, from a particular brew of broccoli soup from the Grand Hyatt Manila (“Obsessed—it tastes cleaner, healthier. It's better”) to serving after serving of spicy laing to a pilgrimage to the country's biggest mall. If he had it his way, he'd squeeze in more things to do, including a planned tour of Intramuros that was hard to put together because the Chinese president was also in town, on his visit to launch the holiday collection of the local retailer. In person, the combination of an unnervingly tiny face, cheekbones so high and sharp, and a mussed-up crown of golden hair gives Barrett the look of a young lion. 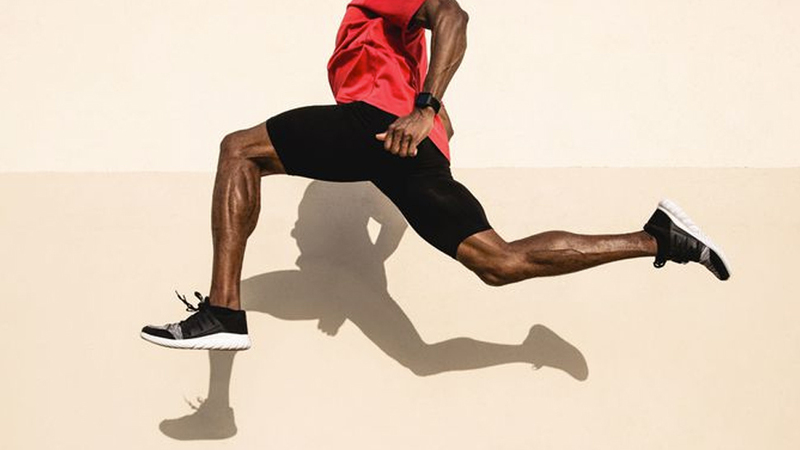 Tall, too, is the model that keeping up with him—and his legs—while on a leisurely exploration is almost like running. Barrett also talks a mile a minute, unleashing an unbroken stream of unfiltered thoughts in that steady drawl of a surfer. Which is just refreshing and makes you like him even more. When you think of the unknowable “it” that makes one person appear like a gem on fire among the dull coals that is all of us, this is it. He has whatever that “it” is. 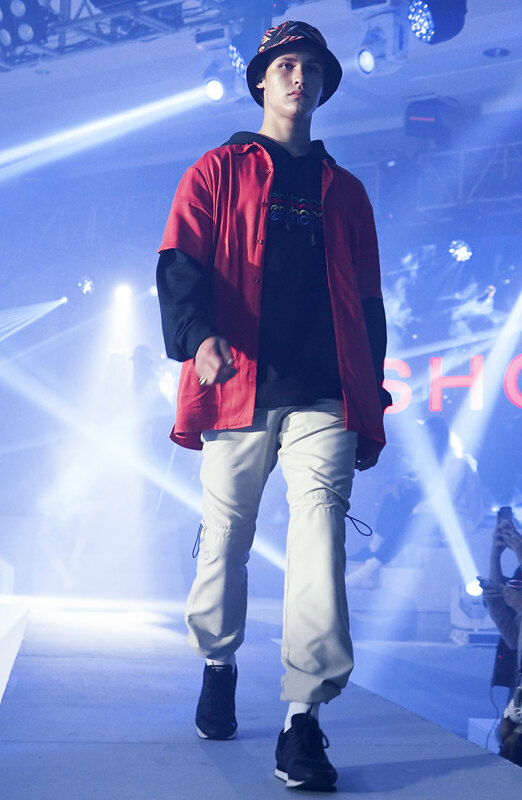 Here, he recounts the amazing moments of his stay in the Philippines and a few memorable experiences from his fashion diaries. His visit to Palawan was the most incredible trip of his life. "Penshoppe promised me once they were going to send me out to the islands in the Philippines, and they were true to their word. They honestly sent me on one of the most incredible trips in my life. You can find the pictures on Instagram. They sent me to Palawan, so I got to spend three days there. And I was also with my sister and my closest friend. We all came from Australia; I happen to be there for a day. We got to fly together and experience the islands, and all the incredibleness of that entire area. It blew my mind, really." Jordan spent half his time in the Philippines enjoying the beach. "It's a different kind of beach. What I got to see here was more flat. We have more waves, lots of waves [in Australia], and it's more like crystal blue water and white sands here—the kind of beautiful [sand] you want to lay on. Half the time we were just laying flat on it. And the water was very salty and beautiful. You never want to shower when you get out of the water because the it is so salty and so nice. Yeah, it's incredible." The friendliness of Filipinos made an impression on the Barretts. "How nice everyone is—it's blown my mind. It's blown my sister's mind. I'm shocked at how nice everyone is. I'm shocked how everyone smiles. Everyone's happy. Everyone's friendly. Everyone's just so sweet and humble and caring. It's the people. Basically here, it's like a family." Jordan is a happy guy who likes being around happy people. "Yeah, I'm a very happy person, so it's nice to be around people with lots of energy. We had dinner last night with the whole crew, and we were all just laughing the entire time. 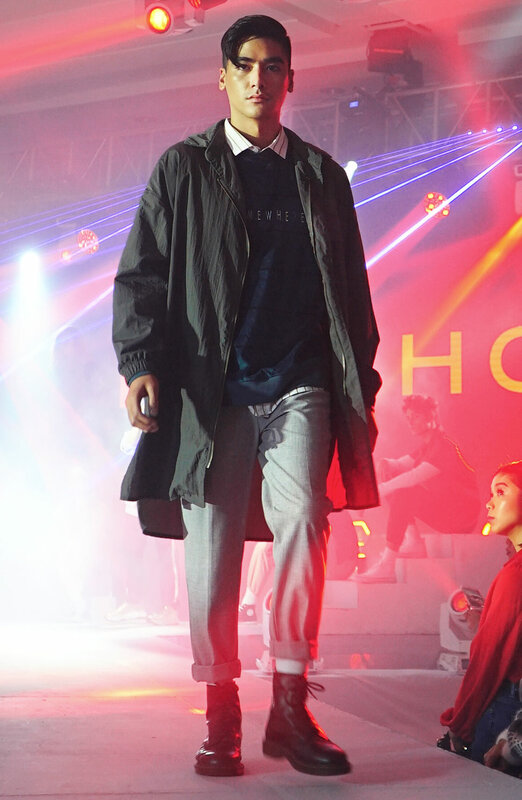 It felt like I was at home with my family, and that's the thing: Penshoppe feels like my Filipino family now." He cleaned out a Penshoppe shop. "Did you find out about that? I got to go shopping there. I got to clean out that entire shop. They go: 'Pick out anything that you like.' I think they had to send a different car with the entire menswear [section] to the hotel. It was a quite big shopping moment in the store." He has a ridiculous collection of clothes. "It's pretty excessive. It's a little ridiculous almost. I don’t [organize them] at all. I fill the rooms in my apartment with masses of clothes, and I get dressed in the morning by picking things up—things that I have not folded. You know my stuff from Penshoppe is just going to go straight into my pile. 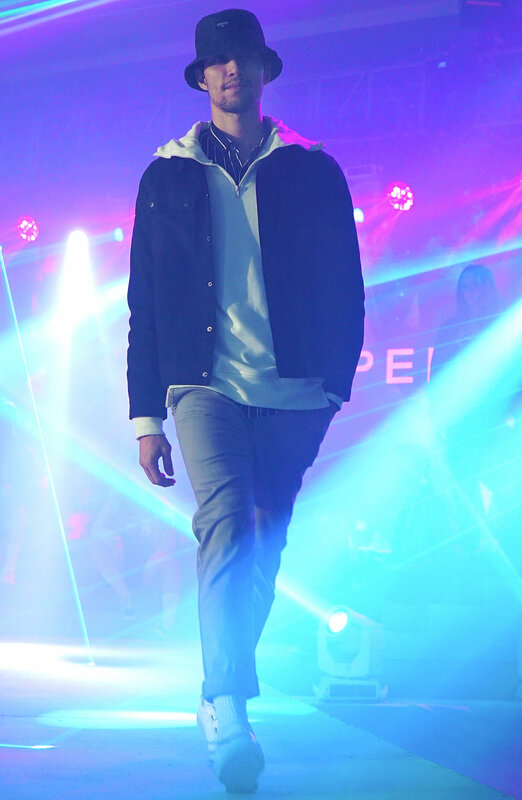 Every time I work with Penshoppe, I beg for everything that I wear in the campaign. The second I walk off the set of the campaign, I ask, 'Guys, do you think I can take it with me?' And they will fill my car up with all the clothes, so I just decided to fill my apartment with just clothes and plants." 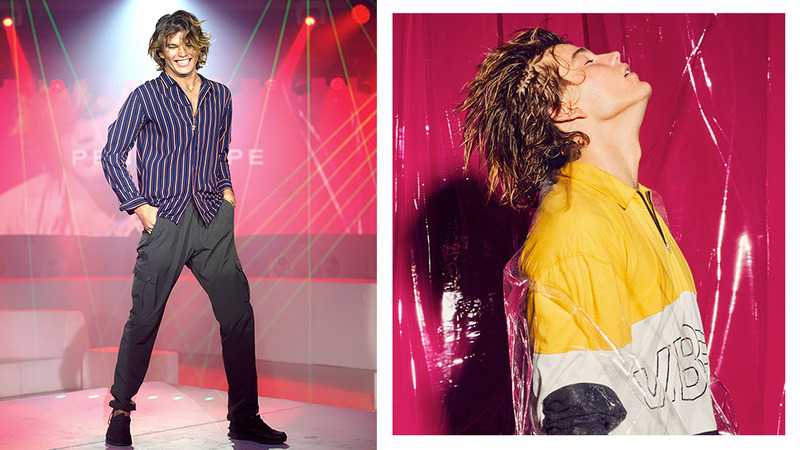 Jordan jumpstarted his style when he moved to New York. "My style evolved, say, from when I was at home, at the beach with my friends, to then leaving [for New York]. I've never been to New York. I've never been to a big city, so really, I would always be wearing minimal, very nothing [clothes]. And then, I got to New York in winter. I was alone, I was 18, and that's how I started. I started buying clothes, I started wearing different things, I started borrowing things from stylists, and got to develop my kind of style. I guess you can see part of it today. It's always something like this. It's always a nice chino and always with a belt. I prefer a high waist. I like a jacket over my top. I like to feel comfy and I like to hide myself a bit—oversize always. These [pants] are 34 and this [jacket] is an extra large. I like things baggy." 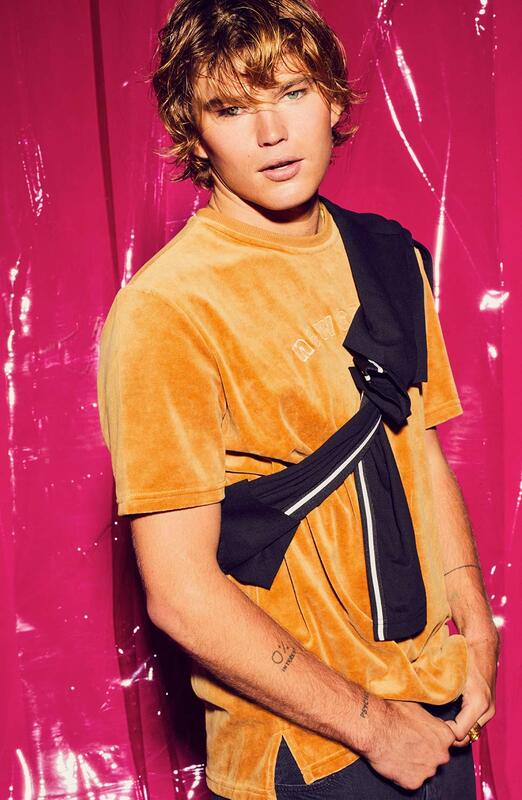 Jordan Barrett's biggest style fail involved a see-through shirt. "Joan Smalls was hosting a True Religion event in New York and I was quite fresh—it was like my first week—and I wore a mesh top and I couldn’t see that it was see through. I didn’t realize it because I left my apartment and it was dark. And I arrived and walked the red carpet. I looked at every picture the next day, and I noticed there were little holes in the entire thing. It was a see-through mesh top. To me, it felt like a jumper. That was a fail. But I still like that top. I just wear a shirt underneath it." He prefers not to make plans for the holidays. "I always get sidetracked and want to go somewhere else in the end, so I stay until the last minute and then I go with whatever plan I can—unless I'm forced to be with my family. You know, I don’t make a plan." He also doesn't believe in Christmas shopping. "I'm not a shopper at all. I don’t buy Christmas presents. I mean, I give my family presents when I go home, but I don’t like the idea of presents for an occasion. I get presents for my friends, family, or people that I love when I see something that I think they like, not because I feel I need to because it's Christmas." He does shop on Amazon. "One thing I buy is Amazon. I have Amazon package after Amazon package after Amazon package, and it's always the strangest items. I don’t buy clothes, and if I do, it's basics. And then Amazon." Jordan's biggest fashion splurge is his last. "I think it had to be when I got to New York. It was probably going through Soho, and dropping by at Acne and Alexander Wang, and getting stuck at Dries Van Noten, and falling in love with certain things at Barney's. That was my first couple of weeks there. There were so many of these stores and I've never even seen the brands at all, and I was like, 'I love it all.' That was my biggest splurge. That's never happening again. Nope." The White Walkers are coming, but sure, let's do this instead. Our favorite bare-hand-steak-eatin' sleazelord showed off some new abdominal ink.